With each stock trading at all-time highs, both Apple (AAPL) and Amazon (AMZN) have performed well so far this year for investors. Both continue to be on a torrid growth path and have a similar enterprise value, but that’s where I see the similarities stop. I consider Apple to still be one of the best stocks on the market. 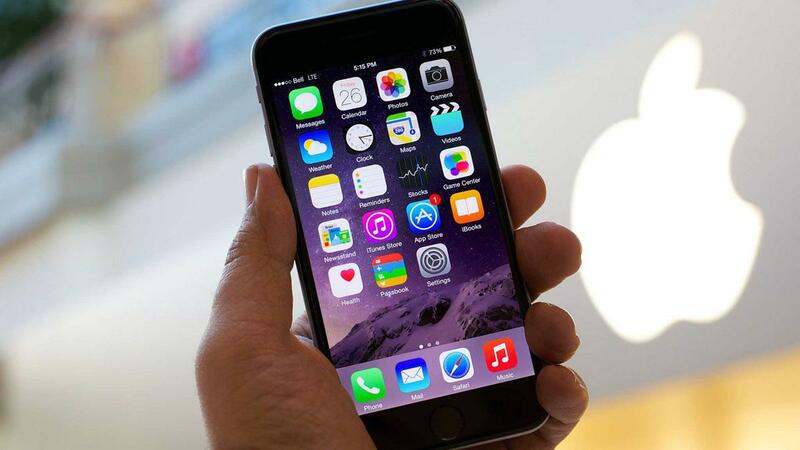 Apple’s combination of operating performance, growth rate, balance sheet, and valuation make it an attractive stock. As an added bonus, Apple has begun returning significant amounts of capital back to shareholders in the form of dividends and share repurchases. Amazon’s revenue is growing at a faster rate, but it’s yet to result in meaningful operating margins, profits, or free cash flow. Right now, Amazon’s valuation is difficult to quantify from a fundamental approach. The stock price is more based on its potential, but I believe this is speculative and greatly increases the stock’s risk. For Amazon’s stock price to make sense, some pretty outrageous assumptions need to be made and it’s still unclear if or when the company can make those achievements. Amazon is growing its sales at a faster rate, but I consider Apple the superior performer given the rate at which its revenue is turned into real profits. Year-to-date, Apple has grown revenue by 15% compared to last year and is on pace for a record year across all major operating metrics. In my opinion, Amazon’s performance still falls a little flat with operating and profit margins that are still less than 5%. 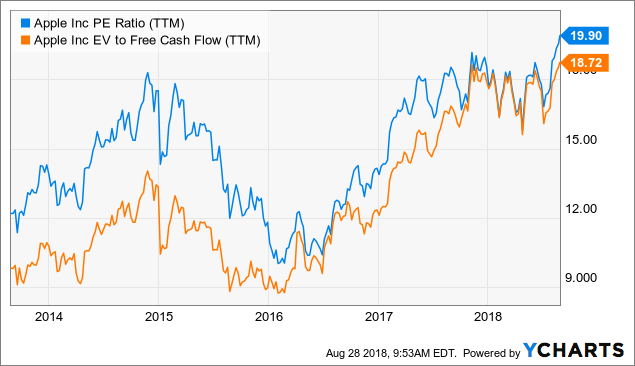 If there’s something to really pay attention to, it’s the free cash flow that Apple and Amazon produce. No company produces cash flow like Apple, which has been funding a massive share buyback program. This has amounted to $53.3 billion spent this year already. Amazon is valued almost as much as Apple, yet produces a fraction of the free cash flow. Just like operating performance, Amazon has yet to turn its large amount of revenue into meaningful free cash flow. I think that Amazon has the potential to reach the levels that Apple is currently at, but how long will this take? It could be 10 years from now and I believe that kind of speculation makes it a risky stock to bet on. With a net cash balance of $129 billion, Apple is the true king of cash and has the far superior balance sheet. This level of cash provides a level of operating flexibility that no company can match in terms of investment and acquisition potential. Amazon has been taking on debt recently and actually has a negative net cash balance, which is a result of some of the things I’ve already pointed out (e.g. no meaningful profits yet). While its level of debt is still small compared to its enterprise value, I do think this is something to watch. Apple’s valuation is rooted in fundamental analysis and looks attractive across the board. I especially like Apple’s 18.7x EV/FCF ratio and a growth rate above 10%. Amazon’s valuation on the other hand is hard to make sense of from a fundamental perspective. As an example, Amazon’s price/sales ratio of 4.52x is extremely high for a company that has had profit margins of only 4% so far this year. 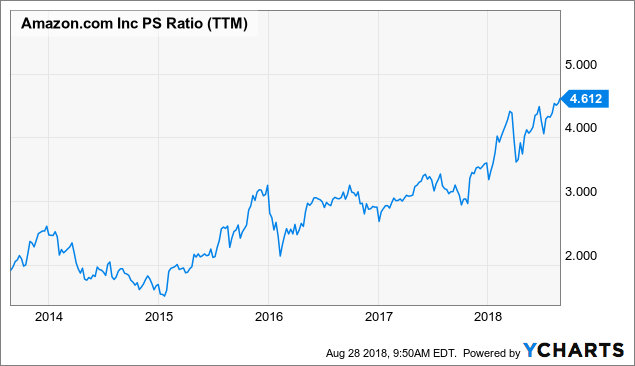 Forward P/E, Price/Sales, and PEG Ratio provided by Yahoo Finance. Wall Street is considerably more bullish on Amazon than Apple. The majority of analysts recommend Amazon as a ‘Buy” and the average target price represents more upside potential. According to MarketWatch, the average target price for Apple is $214, which represents 2% downside based on the current share price of $219. The average target price for Amazon is $2,127, which represents 10% upside based on the current share price of $1,936. I’ve believed for a long time that there’s tremendous risk in Amazon’s valuation returning back to historical averages. A large percentage of the stock price increase has been a result of increasing price/sales multiples, which is now at 4.52x (a crazy number for an e-commerce company) and more than doubled over the last couple of years. For comparison, Walmart’s (NYSE:WMT) price/sales ratio is only 0.55x. Apple’s stock does not have this risk given its current price/sales, forward earnings, and EV/FCF are all very reasonable. Apple trades cheaper at every major valuation multiple. In particular, a significantly lower EV/FCF and PEG ratio are compelling. Apple produces significantly more free cash flow, which has allowed it to amass a cash war chest, fund a dividend, and repurchase stock. Apple’s stock price is a result of strong performance, which is identifiable through its valuation multiples. Apple has tremendous untapped potential, but the stock is valued on today’s performance. Any untapped potential will likely yield additional upside in the stock. Finnish networking and comms giant Nokia has been awarded a €500m (£453.6m) loan by the European Investment Bank (EIB) to further accelerate its research and development around the next-generation 5G mobile network standard. Backed by the European Fund for Strategic Investments (EFSI), part of the European Commission’s (EC’s) Investment Plan for Europe, or Juncker Plan, the loan will provide much-needed support to Nokia as it develops its 5G proposition – an area where European firms are widely regarded as having fallen behind their counterparts in Asia and North America. “We are pleased to land this financing commitment from the EIB, which shares our view of the revolutionary nature of 5G – and the realisation that this revolution is already under way,” said Nokia CFO Kristian Pullola. EC vice-president Jyrki Katainen, who is responsible for jobs, growth, investment and competitiveness, said: “Ensuring that Europe embraces and benefits from new technologies requires sustained investment. That is where the Investment Plan for Europe can play a crucial role. Viavi vice-president of wireless, Li-Ke Huang, said: “The US, China and South Korea have invested early and heavily to try to establish a leadership position in the ‘5G race’. This investment from the EIB is a crucial show of 5G support in Europe, and a demonstration of the region’s commitment to developing next-generation networks. “Sustained backing from private, public and governmental bodies is essential to ensuring that Europe continues to be a major player in cellular communications. Huang said that the strength of its mobile ecosystem through the likes of Nokia and Sweden’s Ericsson meant Europe was still in a strong position to drive development of 5G networks, with support from governments, universities, consultancies, R&D specialists and the wider industry. “Continued financial investment, along with collaboration and knowledge-sharing, will help to promote 5G development across the continent,” he added. Earlier in August 2018, Nokia revealed that it would charge a flat fee of €3 per device to license its 5G patents, substantially undercutting rivals such as Ericsson and Qualcomm. The move has been read as an attempt to reduce the chances of it getting into legal battles with smartphone manufacturers, as well as to increase the attractiveness of its 5G portfolio. Social media platforms’ struggle with safety and security is like a game of Whac-A-Mole. One day, the threat is coordinated bot activity; the next, it’s SIM hijackers stealing the identities of regular users. In an effort to protect Instagram users from those and future threats, the company announced today a set of features designed make Instagram feel “safer,” including ways to protect your own account and to verify whether the accounts you follow are genuine or not. 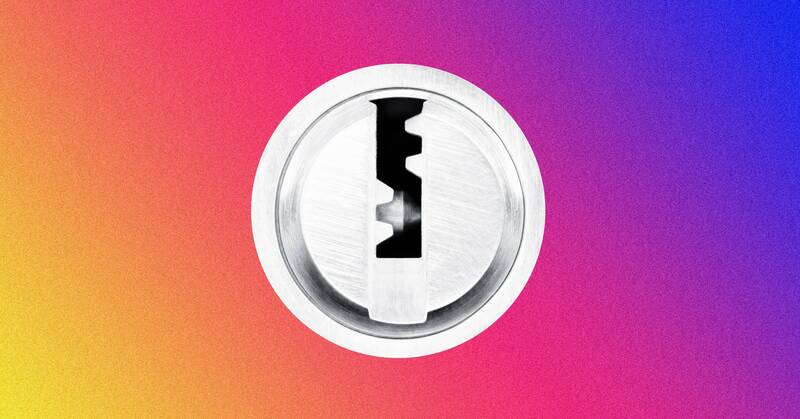 First, all users will soon be able to use a more robust form of two-factor authentication to log into Instagram. Previously, Instagram offered two-factor authentication with a code sent via SMS—better than nothing, but insufficient to protect all Instagram users from having their accounts compromised. (Users with “valuable” handles may be more vulnerable to scams like SIM hijacking, where hackers access a person’s phone number and use it to log into their accounts and steal their usernames.) Now, the platform will allow integration with third-party authenticators, like DUO Mobile and Google Authenticator, which supply two-factor codes locally and provide an additional layer of security against account hacking. To help users differentiate between real and fake accounts, Instagram will now make it easy to look up information about individual accounts, including the date the account was created, its country of origin, and a record of username changes over the past year. You’ll also be able to see any ads the account is running and similar accounts with shared followers. To surface this information, tap the three dots on an Instagram profile page and select the new tab, “About This Account.” The feature will roll out first to accounts with large followings—celebrities, public figures, influencers—and later to all Instagram accounts. Lastly, accounts with large numbers of followers will now be able to request verification from Instagram. The platform already gives blue checkmarks to some celebrity users and brands—WIRED’s Instagram, for example, has one—but the verification process is mysterious, and Instagram hasn’t previously let users request verification. The new verification process involves a request form along with a place to upload a photo of a government-issued photo ID. Instagram says the new changes are part of a roadmap to help the platform feel safe, and to empower users to follow genuine accounts over fake ones. The platform is also hoping not to repeat the same mistakes of its parent company, Facebook, which has struggled to keep fake accounts, misinformation campaigns, and untrustworthy pages off its platform. In the past few weeks, Facebook has removed millions of fake accounts in the past year, and which are becoming harder to trace on the platform. Instagram is, of course, a different beast. As it grows, it will have to face hard decisions about how to create community and trust on a global platform of over a billion users. Checkmarks and two-factor authentication aren’t the end of that story. But they’re a good place to start. Here’s how I imagine the activity at United Airlines HQ. Every day, ambitious managers bang their heads against hard objects, desperate to become heroes in the eyes of their president, Scott Kirby. There’s a suspicion, you see, that Kirby cares more about numbers more than he cares about, say, people. Still, United’s enthusiasm for cost-cutting rather butts heads with its needs to appear more people-friendly. Sometimes, though, you have to marvel at the ingenuity with which executives approach this cost-cutting mullarkey. United’s latest involves going button-free. No, it’s not going to force its employees to wear zip-up shirts. Instead, as Skift’s Brian Sumers reports, a genius who will go far (for free) noticed that the Saks pillowcases in the airline’s Polaris Business Class had buttons. I contacted United to ask which large mind had conjured this cost-saving and will update. We’d all love one of those, but will that ever be possible? One tiny issue United has endured with its Saks bedding is that the high-falutin’ Business Class customers steal it. The airline now has two warnings — or, perhaps, pleadings — to customers not to be so greedy. Customers, you see, shouldn’t dare to take something for free. Don’t they know that airlines now charge for absolutely everything? As an organizational psychologist, one of the topics I study is generational differences. Each generation is different from the last for multiple reasons. The vast changes from one generation to another weren’t as apparent when the world was more local and linear. However, now that the world is global and exponential, each generation has a new world to adapt to from the last. Gen Z kids are digital natives who have never lived in a world without the Internet, smartphones and social media. Their technological skills are intuitive and exceed those of their parents, says Don Tapscott.“This is the first time in history when children are an authority about something really important.” Gen Z kids are innately savvy at technology and innovation; it’s in their blood. These kids care about big and small things going on in the world. They are highly motivated to create solutions to the world’s problems. This deep interest in social issues was not learned in their classrooms. Rather, research has found that global news consumed via the Internet has motivated Generation Z to become more socially conscious than previous generations. “I think our generation is socially conscious, environmentally friendly and they are global thinkers,” says Linda Manziaris, a 14-year-old jewelry entrepreneur who gives half of her income to a charity created by her 16-year-old sister. With full disclosure, I myself am a member of Genius Network, but am under no contract to write about them. As a psychologist as well as an entrepreneur, I’m simply fascinated by all that I’m learning and observing in this unique environment and am passionate to report what I’m seeing. I prefer real-world experience or “field” research to just reading books. Currently, Jesse Kay is a 17-year-old high schooler, podcaster, speaker, and entrepreneur from NJ. Jesse started his first business in 2009 at nine years old flipping shoes on eBay. In his junior year of high school, Jesse began his podcast, 20 Under the 20s, in his high school business class. After sending over 350 daily emails while launching the podcast to get guests, Jesse has interviewed dozens of leaders including Jack Dorsey, Gary Vaynerchuk, Grant Cardone, Paul Rodriguez and others to over 100,000 listeners. Jesse is focused on sharing practical lessons and stories from some of the best minds on the planet to help inspire young men and women to become tomorrow’s entrepreneurs. Jesse has been featured in a variety of global publications including HuffPost, Entrepreneur, Adweek, and Business Insider. Along with hosting his podcast, Jesse has spoken across North America and runs a digital consulting agency helping Fortune 500 brands including the NY Knicks, NY Rangers, Madison Square Garden and influencers (over 5M followers+) connect with their youth customers and fans via social media and digital marketing strategies. Connor Blakley, 18, is a keynote speaker, and founder of Youthlogic, a marketing consultancy that helps Fortune 1000s better understand today’s youth. Connor has been quoted and published in both national and international media outlets including Forbes, MIC, Business Insider, Inc, Entrepreneur, Mashable and the BBC for his unique perspective and understanding of Generation Z.
Brennan Agranoff is a 17-year-old entrepreneur who founded his company HoopSwagg, a leader in the athletic sock industry when he was only 13 years old. Since founding HoopSwagg four years ago, he has grown the company to over $1,000,000 in annual sales and employed more than 40 people. Agranoff has been featured in major media outlets around the world including CNN, Forbes, ABC, Associated Press, Dailymail, NBC, U.S. News & World Report, and Galileo TV (Germany). With its nearly half a million fans and followers on social media, HoopSwagg is poised to continue its speedy ascent to the top of the billion-dollar sock market. Jonah Stillman is an author, professional speaker, and entrepreneur. He is the co-author of Gen Z @ Work and has already shared his insights with a variety of companies and industries as well as contributed to stories about Gen Z with MSNBC, CBS, and Fast Company. Jonah is a nationally ranked alpine snowboarder and has served as an ambassador for the international nonprofit WE, traveling to Kenya and Ecuador to build schools. He is also the Gen Z Ambassador to the NFL and Minnesota Vikings. Jonah and a team of peers conducted one of the first national surveys about Gen Z’s attitudes towards the workplace. The eye-opening results ignited Jonah’s interest in keeping the dialogue going. He is excited to be the voice of his generation and offer companies and organizations a heads-up about our next generation gaps. Noa Mintz is the 18-year old founder of Nannies By Noa, a leading nanny placement service based in New York City. With its large network of highly experienced sitters and nannies that possess a passion for children, Nannies by Noa is the leading destination for reliable, engaging, and educated childcare providers. Like many entrepreneurs, Noa experienced first-hand an issue that needed improvement – caregiver accountability; her parents wanted to trust, and assurance and she and her siblings wanted a “city-savvy” babysitter who was fun and interactive. By the time she was 12, she had successfully secured caregivers for her own family and had begun recruiting for other families in New York City. At age 12 ½, Noa launched Nannies By Noa which was built around her innovative approach to matching families and caregivers. Along with her talented team, Noa raises the bar of what to expect from a caregiver, making it standard practice for her nannies to be active and engaged participants in the lives of the children they care for. Noa has been interviewed on national television shows including NBC “Today Show,” CNBC “Squawk Box,” “Money with Melissa Francis,” and her entrepreneurial story has been shared by the likes of CNN Money, The New York Post, Teen Vogue, Buzzfeed, Mashable, and many others. Celebrities such as Ashton Kutcher, Lil Wayne, nd Zoe Deschanel have also shared Noa’s story via social media. Allan Maman, 18, is a serial entrepreneur who has founded many successful companies. He is best known for helping create the Fidget Spinner Trend when he was only a senior in High School. Through his main company Fidget360, he has generated hundreds of thousands of dollars in revenue, got live coverage on national television through CNBC in front of millions, featured in Forbes, Inc, TIME, Business Insider & more. This was all done in an 8 month span. After this, Allan has continued to move onto numerous companies that have generated hundreds of thousands of dollars. Geron (GERN) presents a simple value proposition. If its contribution to cancer treatment can reel in the big fish that has been on its hook since 2014, Geron’s investors will prosper. Otherwise not, or so the conventional thinking has been. This article will stick with the conventional thinking for the time being. Latest signs are that Geron’s long prosperity is coming into sight. Let me explain. The shorts have been dogging Geron for years; a comeuppance is due. Anyone who defends one of these hit pieces is “questionable.” At best, they are prisoners of some long forgotten American virtue like fairness. At worst, they, or their friends, are trying to drive the stock down so that they can profit from losses by some virtuous long who can no longer stand the insult. At this point, I have a hard time believing that bear raids on Geron are truly damaging for committed investors. Sure they are a nuisance and create disappointing distortions in the share price; however, they can’t change the material issues. They can’t change (1) whether or not Johnson & Johnson’s (JNJ) subsidiary Janssen exercises its continuation rights under its 2014 collaboration agreement with Geron, and (2) whether Geron has sufficient cash to effectively elect whether or not to “opt-in” or “opt-out” following a continuation decision. …ending the second quarter with $181.4 million in cash and marketable securities. This, coupled with the $65 million fee it would garner following its opt-in decision, should be sufficient to satisfy Geron’s credibility in opting-in. Geron has travelled a long and lonesome roadway. 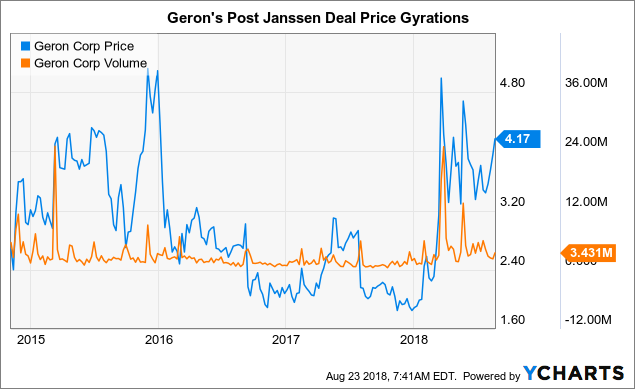 Geron’s Janssen collaboration deal has kept Geron’s investors on tenterhooks since it first came into being on 11/13/2014. slightly better than even, where we started before the deal was announced. Of course when you consider opportunity costs, it has been an expensive endeavor. The premise of this article is that a breakout is imminent. Regardless of all the sturm und drang that may arise over Geron’s long travails, there is one key point. Will Janssen elect to take the next big step of issuing a positive continuation decision? The latest information on Nasdaq (as of 7/31/2018) shows Geron short interest at >58 million shares. This is its highest reading for the last year. This creates a deep reservoir of motivated buyers in the event of positive developments for Geron. Note the volume and price spikes early in 2018 shown on Geron’s stock price chart above; these are aborted runs that Geron has already made when sentiment favored a positive continuation decision. The last upward sloping line on the chart reflects Geron’s current trajectory. If Janssen elects to go ahead, it should create a classic short squeeze as the shorts stumble over themselves to acquire shares so that they can close their short positions. We should know Janssen’s decision by September 30, 2018. Relying on Parkinson’s law, I have been of the opinion that Janssen would run out its string all the way or close to 9/30/18 before we would know anything definitive. As I will discuss, recent news suggests an earlier decision could be at hand. Shimmering through the distorting heat, our destination, possibly on a near horizon, appears closer than the maps predicted. Johnson & Johnson (JNJ +1.9%) will host a conference call for investors at 8:00 am ET on Thursday, September 13 to review its pharmaceutical business. This slight blurb positively lit up the comment stream to this metaphoric article. The range, and depth of analysis was quite intense. The fact that caused all the interest was the temporal proximity (9/13/18) of the conference call to the 9/30/18 expected continuation decision. Impromptu investigative reports established that this 9/13/18 CC was not in proper sequence with Johnson & Johnson’s regular biannual reports. Naysayers volunteered that this could simply be a coincidence or possibly the beginning of a new sequencing of conference calls. One point that seemed to draw broad consensus was the notion that, if the call addressed the continuation decision, it likely was not a negative continuation decision. No one is likely to call special attention to a failed initiative. Several noted that a call themed around JNJ’s hematology portfolio would be appropriately timed around 9/13/18, the starting date for the next World Congress of the International Society of Hematology (ISH). This plays directly into a discussion of IMerge and IMbark and the continuation decision. I am agnostic as to whether or not 9/13/18 will prove significant in fact to the Geron saga. 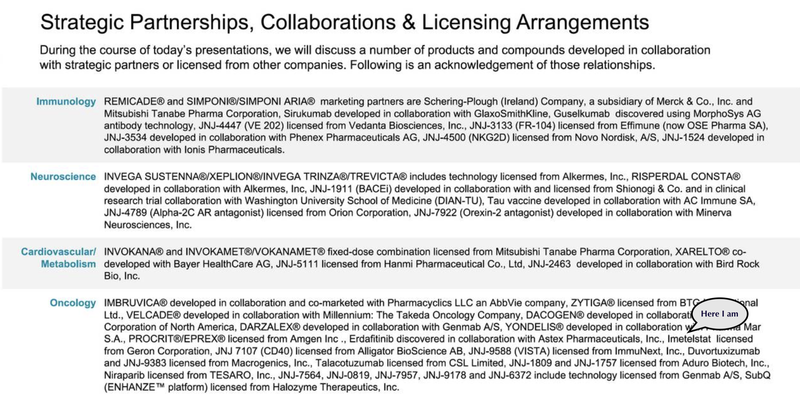 I did check out the slide deck from Johnson & Johnson’s last regularly scheduled Investor Presentation (Pharmaceutical Business Review Day). It was a gargantuan 353 slide affair. My take from this is that Janssen’s Geron deal is riding a crowded train, not driving a car. 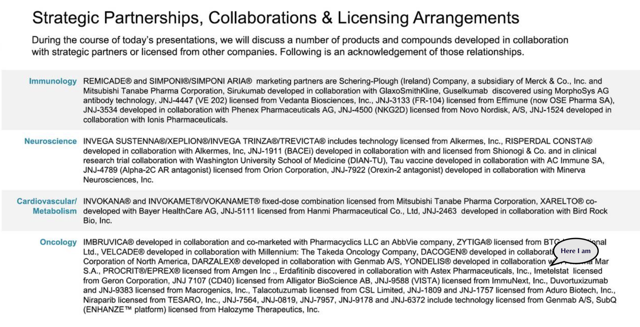 It seems unlikely that Janssen’s Geron collaboration is a major player in Johnson & Johnson’s 9/13/18 conference call. If it is, I will be elated that I was wrong. No harm, no foul. Never mind, this entire 9/13/18 CC is a distraction. If it brings good news for longs, then it will be good news indeed. If, as I expect, it has little or nothing to do with Geron, then forewarned is forearmed. We still have a short stew on the near horizon. The longer this stew simmers, the more savory it becomes. I have said it ad infinitum. I will say it again. I think Geron has the best short fuse risk-reward ratio of any stock I know. $10 by 10/10 – that is the clear diktat from my latest seance. Nonetheless, it carries great risk. Do not invest more in this stock than you can afford to lose. It can be extremely exciting to follow its various nuances; I have to remind myself to curb my enthusiasm to keep from overcommitting to the name. I suggest that my readers do the same. Disclosure: I am/we are long GERN, JNJ. Additional disclosure: I may buy or sell shares in GERN or JNJ over the next 72 hours. SAN FRANCISCO (Reuters) – Venture firm Lead Edge Capital, which has backed companies such as Uber [UBER.UL] and Spotify, has raised its largest fund to date in the latest sign of the rush of capital flowing into private tech companies. BEIJING (Reuters) – Alibaba Group Holding Ltd (BABA.N), the world’s biggest online retailer, topped first-quarter revenue estimates on Thursday, driven by growth in its core e-commerce business. Alibaba’s U.S.-listed shares rose about 3 percent in premarket trade. The company’s revenue rose 61 percent to 80.9 billion yuan ($11.77 billion) in the April-June period, compared with the average analyst estimate of 80.7 billion yuan, according to Thomson Reuters I/B/E/S. Net income attributable to shareholders, however, fell 41 percent to 8.7 billion yuan, or 3.3 yuan per share, due to one-off costs related to share-based compensation for Ant Financials’ recent fundraising. While revenue growth has accelerated since Alibaba’s 2014 stock exchange listing, aggressive investment in offline retail, logistics and cloud computing has squeezed profit margins. Excluding items, the company earned 8.04 yuan per share, or $1.22 per share, missing the average estimate of 8.15 yuan per share. Sales at Alibaba’s core e-commerce business rose 61 percent to 69.2 billion yuan, compared with a 58 percent rise the same quarter a year earlier. Alibaba also said it formed a holding company for online food delivery service Ele.me and e-commerce platform Koubei, for which it received over $3 billion in new investment commitments, including from Alibaba and SoftBank, the company said. Alibaba’s core businesses include online marketplaces Tmall and Taobao and payment platform Alipay. Like most Chinese e-commerce firms, revenue is typically higher in April-June versus three months prior due to a mid-year sale which peaks on “lucky date” June 18. However, analysts said sales were likely lower this year due to public holidays during the event. Last week, rival JD.com Inc (JD.O) said it missed targets for the event due to an unexpected slump at the end of June.